Nobel Prize winner George Stigler said “a transition period is a period between two transition periods.” After almost 17 years with Utah’s Automated Geographic Reference Center (AGRC), five of them as director, I am about to transition into a new role with a new organization. Next week, I’ll hand over my key card to the Utah AGRC office, take a two week break, and then head down the street to the Wasatch Front Regional Council, the metropolitan planning organization for the Salt Lake - Ogden metro area. My new job is leading WFRC's section of GIS, data science and transportation modeling staff, in supporting mid- and long-term planning for infrastructure projects, transit, economic development, land use and air quality. This change is bittersweet, for sure, for many reasons - I am leaving a job that I’ve loved and found fulfilling, with an outstanding team and colleagues across state and local government - and also because I will be passing along Utah's NSGIC State Rep torch (a la Minecraft) that has connected me to so much expertise and important personal and professional connections. It's an exciting time for me as I contemplate new possibilities, but also a time for reflection. NSGIC has played a major supporting role in what Utah and AGRC has accomplished during my time here and the last two-and-a-half years as NSGIC president-elect, president, and now past president have been incredibly rewarding. A lot of work, but incredibly rewarding. 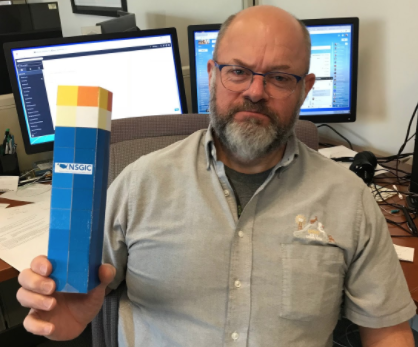 Here in Utah, we’ve benefitted greatly from the wisdom and experience of our NSGIC peers as we've worked on issues ranging from statewide aerial photography, to NextGen 911 GIS preparation, to cloud-based geospatial services hosting and delivery, to the implementation of a PLSS cadastral fabric. In many ways, state GIS offices were a little late to the traditional government agency stable. Our positioning is not nearly as well entrenched as many of our sister agencies in government. That makes our job that much more challenging and keeps us on our toes -- staying current with technology with an eye toward landing opportunities that return great value. I’ve been thinking, too, about NSGIC’s transition over these past two-and-a-half years. It seems similarly driven. We went from no staff to a staff of four, including the organization’s first executive director. We’ve gone from depending entirely on contractors to building internal capacity with meetings, program and communications expertise on staff. The board has made a major shift from a managing board to a governance board. We have a new website with an integrated member database, a new event registration system, and new ways to communicate within and beyond our community. We’ve overhauled our sponsor partnership model and we've secured our first foundation support in the form of the Geo-Enabled Elections (GEE) project. It's been rewarding to watch the progress that has been made and the improved overall positioning. I intend to stay involved in NSGIC, through Utah's state council level membership that AGRC and Utah Geographic Information Council jointly sponsor. And, I think there’s fertile collaboration between the NSGIC space and the metro/regional planning groups that can be informative to both sides. I look forward to reporting back on this seemingly parallel universe and the opportunities for NSGIC'ers to connect with it. And I’ll continue to actively contribute to the NSGIC elections project that is just getting off the ground. I'll close by getting back to the introduction of this post. If Dr. Stigler** was right and life is essentially a series of transitions strung together, I’m glad to have the opportunity to pause here for a second <breathe in> to express my extremely deep gratitude to my Utah AGRC and NSGIC teammates and colleagues <breathe out>. The only real accomplishments in our field are the ones we build toward together. It couldn't be more true. I look forward to seeing you all in Salt Lake for the NSGIC midyear, and beyond as our paths are certain to continue to cross. With that said, please wish me luck as I get ready to turn the page to the next chapter of my career. Stigler's most important contribution to economics was published in his landmark article, "The Economics of Information,” which contributed to new areas of study for economists. Stigler stressed the importance of information: "One should hardly have to tell academicians that information is a valuable resource: knowledge is power. And yet it occupies a slum dwelling in the town of economics."